What is the best way to grasp the paradox of Mark Nauseef? Across a long and storied career performing with, well, pretty much everyone in and outside of jazz/avant/experimental musics, realizing a vast catalog of virtually uncategorizable recordings on an endless run of labels (CMP, MA, Unit, Enja, Leo, Tzadik, Wergo, psi, etc. ), how is it that Nauseef is still considered something of a 'marginal' figure? Why isn't he sui generis at this juncture? The simple truth is that there are just as many noteworthy musicians and sound artists who, consciously or not, refer to Nauseef's towering gestures when they themselves indulge in all manner of hits, smacks, thumps, rolls, and thwacks on their own weathered surfaces. And though he might not be a household name, Nauseef is actually far from marginal; his presence on a given record or stage is a near guarantor that the listener will soon experience something transcendent. 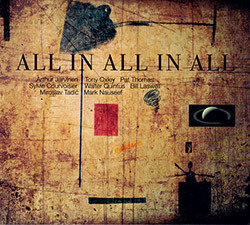 Though there are eleven tracks, the entirety of All In All In All ostensibly flows as a suite of diverse movements, moods, incongruities, flights of fancy, and abstract explorations. There exists an overt parallel drawn between the collage of the tri-fold artwork and the puzzlework construction of the music therein. Splashed on the digipak's panels are 'remixed'/reconstituted images from Nauseef's preceding releases, images from his work with early ensemble Dark (and subsequent quasi-regular partnerships with guitarist Miroslav Tadic, including the wonderful Snake Music), some extant CMP collaborations, particularly with David Torn, in addition to the shamanistic audiovisual merging found on his solo albums Wun-Wun and Sura. All In All In All could function as a career summation for Nauseef if the man were suddenly shot off into space, but (thankfully) he's still very much alive and active. It begs the question as to why Relative Pitch presents the album as it does, but no matter � such considerations don't detract one iota from the music's perpetual motion and breathless imagination. The lengthy track eight perhaps best reflects the canny goings-on that Nauseef corrals under his astute roof. Throughout its near fourteen-minute duration, we witness a cascading tumult of glimpsed and half-glimpsed sonic events; as there is an ample employment of electronics about, and various players double on their respective noisemakers, who's doing what remains mysterious and immutable, but in the end such specificities become moot. Nauseef and fellow percussionist Tony Oxley offer the initial percolations, followed by the probing piano strikes of Sylvie Courvoisier; these are soon joined (interrupted?) by peek-a-boo electronic nods and whispers, until Bill Laswell's recognizable bass lava thrusts up and under the bubbling seismic activity. What follows is a mighty battle to rescue nuance from chaos, as Tadic, Walter Quintus, and the rest of the collective out-spray their acoustic/electronic/found sounds with Pollack-like exuberance and a profound feel for eclectic, visionary color. Hard to believe this music is eighteen years old, it could've been made then, today, or tomorrow. Like all great art, its execution is flawless, its urgency unquestionable, and its relevance timeless. Brighter than a thousand suns.